On a recent trip to India, I had the opportunity to visit a few of our end user clients in the field to see how they were using our products. On one occasion, we visited a tractor assembly plant. One department in the plant was responsible for machining the finished surfaces of the cast iron parts that made up the sub-frame of the tractor. The surfaces that mated together needed to have a finish cut made on them so that the gaskets used could seal properly on a flat surface. The original problem was that once a part was completed with the machining cycle, the cast iron chips remained in the fixture that holds the part. This material interfered with proper mounting of the next raw part into the machining fixture. The customer then tried the EXAIR Chip Vac System to remove the chips from their fixture between each cycle. The Chip Vac System performed excellently for this task. And so the customer decided to up-fit all of their machining centers with Chip Vac Systems. They could turn their existing 55 gallon, open top drum in to a collection tank by applying the Chip Vac lid and filter assembly. The drums were not being used prior to applying Chip Vac, so it was viewed as a good re-purposing of the drums. There are no moving parts to wear out with the Chip Vac. Motors, brushes and impellers used on traditional electric vacs simply do not stand up to industrial use as in these cases. The sound level produced by a Chip Vac is far lower than an electric vacuum. There are presently no such ministry of health rule in India which govern this issue, but the operators were definitely happy about less noise and so was the shop foreman. 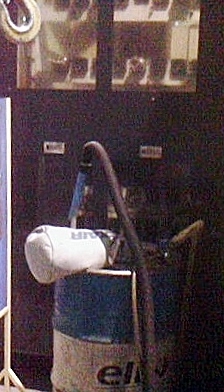 The 10 ft. hose easily reached inside the machine center to allow for quick and easy access to the fixture for vacuuming task. EXAIR is a company who developed our Industrial Housekeeping Products out of need in our machine shop to have reliable products which were convenient to use. It is always good to see when others who have similar needs, use our product for the same kinds of problems we encounter when working in our own production areas. Our Industrial Housekeeping Products consist of a wide range of products which include: Chip Vac, Heavy Duty Dry Vac, Reversible Drum Vac, Chip Trapper, Heavy Duty HEPA Vac and last but not least, Vac-U-Gun and Deep Hole Vac-U-Gun systems. We are here to assist you in selecting the right product for your application. Please call us today to discuss your specific application needs.